Today's transportation professionals, with limited resources available to them, are challenged to meet the mobility needs of an increasing population. At many highway junctions, congestion continues to worsen, and drivers, pedestrians, and bicyclists experience increasing delays and heightened exposure to risk. Today's traffic volumes and travel demands often lead to safety problems that are too complex for conventional junction designs to properly handle. Consequently, more engineers are considering various innovative treatments as they seek solutions to these complex problems. The corresponding report, Alternative Intersections/Interchanges: Informational Report (AIIR) (FHWA-HRT-09-060), covers four intersection designs and two interchange designs. 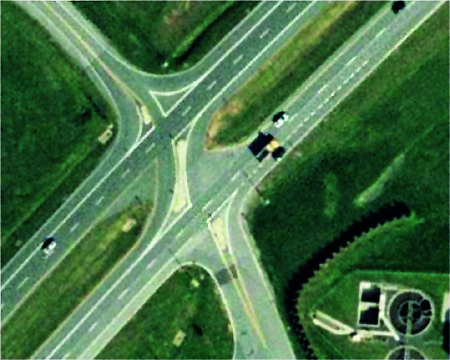 These designs offer substantial advantages over conventional at-grade intersections and grade-separated diamond interchanges. The AIIR provides information on each alternative treatment and covers salient geometric design features, operational and safety issues, access management, costs, construction sequencing, and applicability. This TechBrief summarizes information on one alternative intersection design-the restricted crossing U-turn (RCUT) intersection (see figure 1). Figure 1. Photo. RCUT intersection in Troy, MI. The RCUT, also referred to as the superstreet intersection or J-turn intersection, is characterized by the prohibition of left-turn and through movements from side street approaches as permitted in conventional designs. Instead, the RCUT intersection accommodates these movements by requiring drivers to turn right onto the main road and then make a U-turn maneuver at a one-way median opening 400 to 1,000 ft after the intersection. Left turns from the main road approaches are executed in a manner similar to left turns at conventional intersections and are unchanged in this design (see figure 2). Left-turn movements from the major road could also be removed at primarily rural unsignalized RCUT designs. Figure 2. Illustration. Typical RCUT plan view with crossovers on mainline approaches. RCUT intersections have been constructed in several States following the introduction of the concept in the early 1980s. (1) An RCUT at a location in Michigan is shown in figure 1. Other installations include three unsignalized RCUT intersections on U.S. Route 301 on Maryland's Eastern Shore and two on U.S. Route 15 in Emmitsburg, MD. One of the Emmitsburg, MD, installations is shown in figure 3. RCUT intersections have also been recently installed at several locations in North Carolina, including a 2.5-mi stretch of U.S. Route 23/74 in Haywood County, where three RCUT intersections were installed. Five RCUTs were also installed on Route 1 in Lee and Moore Counties, and three were installed on a signalized corridor of U.S. Route 17 in Brunswick County. Figure 3. Photo. U.S. Route 15 RCUT intersection in Emmitsburg, MD. The RCUT intersection has either no median openings at the intersection or has only one-way median openings for the exclusive use of left-turning traffic from the main road. Desirable minimum median widths between 40 and 60 ft are typically needed to accommodate large trucks so that they do not encroach on curbs or shoulders. RCUT intersections with narrower medians need bulb-outs or loons at U-turn crossovers (see figure 4). The spacing from the main intersection to the U-turn crossover varies in practice. The American Association of State Highway and Transportation Officials recommends spacing of 400 to 600 ft based on signal timing. (2) The Michigan Department of Transportation recommends 660 ft ±100 ft, and the North Carolina Department Transportation standard minimum spacing between main intersections and crossovers is 800 ft.
Driveways should not be allowed near the main intersection or on the opposite side of the arterial from the median U-turn (MUT) to reduce the chance of wrong-way movements in the crossover. Pedestrian crossings of the major road at the RCUT intersection are usually accommodated on one diagonal path from one corner to the opposite corner (see 5). Figure 5. Illustration. Pedestrian movements in an RCUT intersection. One typical design (as in figure 2) of an RCUT intersection may have three distinct intersections operating under traffic signal control with just two phases and relatively short cycles. Signal warrants provided in the Manual on Uniform Traffic Control Devices (MUTCD) provide key guidance on the justification for signal control at the locations where U-turns are made. (3) One theoretical benefit of the RCUT intersection is that signal controllers for one direction of the arterial could be operated independently of the signal controllers for the opposite direction of the arterial. It is also feasible to use one controller for the three signal locations. Up to a 30-percent increase in throughput (i.e., the number of vehicles exiting the intersection). Up to a 40-percent reduction in network intersection travel time. RCUT intersections have 18 conflict points compared to 32 at conventional intersections. The RCUT intersection appears to offer substantial safety advantages over conventional intersections. For example, for the RCUT intersections on the U.S. Route 23/74 corridor in North Carolina, there was a 17-percent decrease in total crashes, a 31-percent decrease in total crash rate, a 41-percent decrease in fatal/injury crashes, and a 51-percent decrease in fatal/injury crash rate. Higher reductions were observed for the three unsignalized RCUTs that replaced conventional intersections on the Eastern Shore of Maryland. For the U.S. Route 17 corridor in North Carolina, total crash rates were found to be lower than the 10-year average for 25 signalized conventional intersections in Charlotte, NC, with comparable annual average daily traffic. Relatively low to medium side-street through volumes and heavy left-turn volumes from the major road. The minor road total volume to total intersection volume ratio is typically less than or equal to 0.20. Areas where median widths are greater than 40 ft. For narrower medians, loons on the shoulders need to be constructed. For intersections with very high left-turn and through volumes from the side road approaches, RCUT intersection design is not the optimum choice. Refer to the AIIR for other alternative treatments. RCUT intersections reroute minor street left-turn and through movements to an MUT crossover and thereby provide major advantages, including reduced delay and congestion for through traffic on the major road and reduced opportunities for crashes compared to conventional designs. More details on the RCUT intersection can be found in the full AIIR available from the Federal Highway Administration. Kramer, R.P. (1987). "New Combinations of Old Techniques to Rejuvenate Jammed Suburban Arterials, Strategies to Alleviate Traffic Congestion," Conference Proceedings, Institute of Transportation Engineers, 139-148, Washington, DC. Federal Highway Administration. (2003). The Manual on Uniform Traffic Control Devices (MUTCD), Washington, DC. Availability-This TechBrief may be obtained from the FHWA Product Distribution Center by e-mail to report.center@dot.gov, fax to (814) 239-2156, phone to (814) 239-1160, or online at https://www.fhwa.dot.gov/research/tfhrc/programs/safety/. Key Words-Superstreet, Alternative intersection, Restricted crossing U-turn, RCUT, and J-turn intersection.